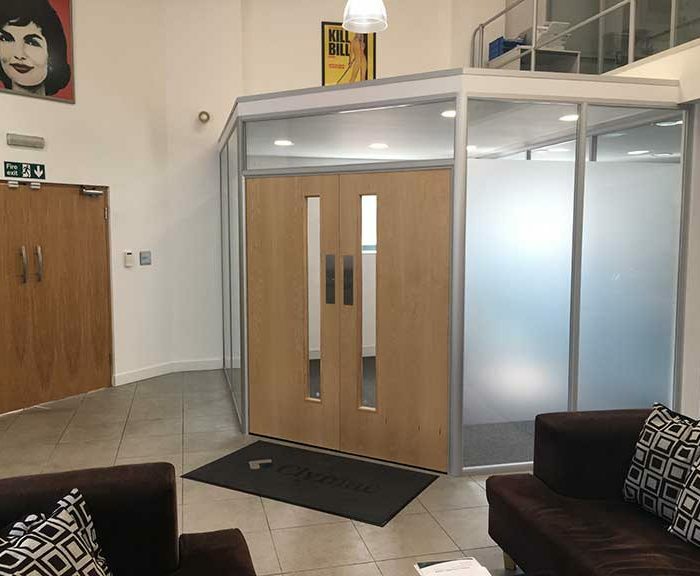 Our position as Nottingham’s leading office partition installer and contractor is secured by our ability to supply and professionally fit all types of office partitions, from fixed office partition walls, demountable partitions, glass office partitions and more. Our multiskilled design team can ensure the coherency of your current office style by identically matching any style of partition with the colour of your existing walls, and their experience enables them to offer expert advice about a range of modern products which will add a smart finish to any style and layout of office. Regardless of whether you need a reception or meeting room refurbishing or fitting-out, your office dividing into distinct departments or would simply like to add a little more dedicated space to your office while preserving privacy and soundproofing, Elite have the professional level of workmanship and reputation you can trust for any size of job and its degree of complexity. Our dedicated team of specialists will accommodate any requirements and budgets, and provide tailored advice accordingly. We also pride ourselves on ensuring each and every job is completed on time and with as little disruption to the ordinary functioning of your business as you would hope for. While based in Nottingham, we also serve all broader areas of the East Midlands and West Midlands including Nottingham, Derby, Leicester, Coventry and Birmingham. Please see below for some examples of the custom office partitions we source and install, or feel free to get in touch to discuss your requirements and to receive a free, no obligation quotation. If you have already designed and agreed upon an alternative layout for your office that best incorporates your workflow, then we can supply and fit fixed and solid partition walls decorated in-line with the chosen style of your office, and offer a wide range of partitioning solutions to suit all budgets. We invite you to browse through our budget line of partitions if a simple wall is what you feel will best sit within your office design. We supply and fit fully demountable office partitions. These can be very quickly installed, so are the ideal choice when time is at a premium so far as construction is concerned, and once in situ, they can be very easily relocated in your office as the need arises. These partitions are available in many customisable forms – solid walls, floor-to-ceiling glass, half and half, glass with integrated blinds – all which can be finished in any colour appropriate to your office design. They provide privacy, sound protection and are as reliable as they are easy to install. We can even arrange an out of hours fitting if you prefer this option. If you are looking to establish a professional and welcoming first impression to your clients by way of an impressive reception area, or are looking to erect meeting areas in which staff are happy to gather, then we have the track record to support your ambitions and provide the ideal solutions for either scenario. Whatever you are hoping to achieve through open spaces either relaxed or formal, feel free to speak with us about which of our products will best serve the purpose. These products come in many shapes and sizes, but are now a common feature of offices which value design and comfort. We can source and fit pods that offer an unrivalled level of modernism and novelty to meeting rooms, while also having a stylish appearance in their own right. They are an ideal method of breaking up open spaces, and are certain to impress employees or clients alike. These are comfortably the most popular choice for a diverse range of clients at the moment, and we take great pride in being able to offer a large degree of customisation to our range of glass partitions. Completely glazed versions let the light entirely through and manage to keep an on office looking spacious rather than restrictive, while still being able to ensure privacy if used to demarcate a meeting area. Glass partition walls are often finished with a design of graphics for a professional touch, or an application of manifestation for safety reasons. This application can still adhere to your valued company branding though, and we can arrange to have your logo etched on to the glass. We also supply and fit fully or semi frosted partitions, either of which allow light to disperse to a different extent when strategically installed. The budget version of our glass partition range simply adds a 25mm aluminium joint vertically down the glass panel. This in no way detracts from the stylish appearance of our partitions, and are an appropriate option to consider not only if you’re working to a tight budget, but also if you prefer a glazed wall or something that bit more inviting than a solid partition wall. Learn more about our glass partitions. In addition to the above, our comprehensive product range means we can also offer the following partition types. While a degree of noise in the office environment is inevitable, it can sometimes make it hard to think, which can itself hamper productivity and the quality of work generally. A soundproof partition will increase not just the silence, but also concentration levels. Needless distractions will become a thing of the past due to the materials used in our high quality partitions, and will give you the much sought after privacy your office might benefit from. 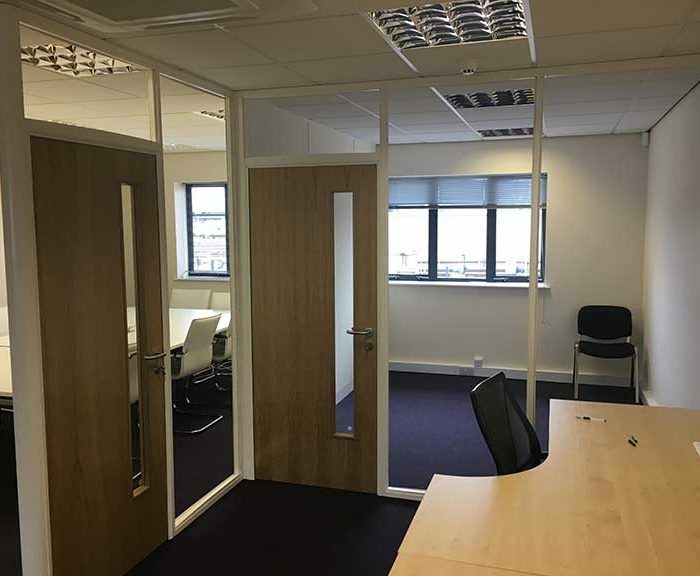 We are pleased to offer such partitions, as these will ensure that your building complies with building controls and all appropriate legal requirements. Of course, they are an added and proven safety measure to everyone in your building in the event of a fire. These can be used in any way you like, to include their matching your existing core walls. We can erect them through a suspended ceiling to save on sound transfer, or to give you a fire rating (different boards are supplied for each). Your ceiling will then be re-fixed to the wall, so it looks like it was always there.